Please join the Louisiana Sports Hall of Fame and Northwest Louisiana History Museum as Northwestern State University Associate Professor Dr. Susan Dollar discusses the role Louisiana played in preparation for the United States’ entry in World War II. Dr. Dollar will share “behind the scenes” stories from central Louisiana on how mobilizing for the impending fight impacted its citizens. 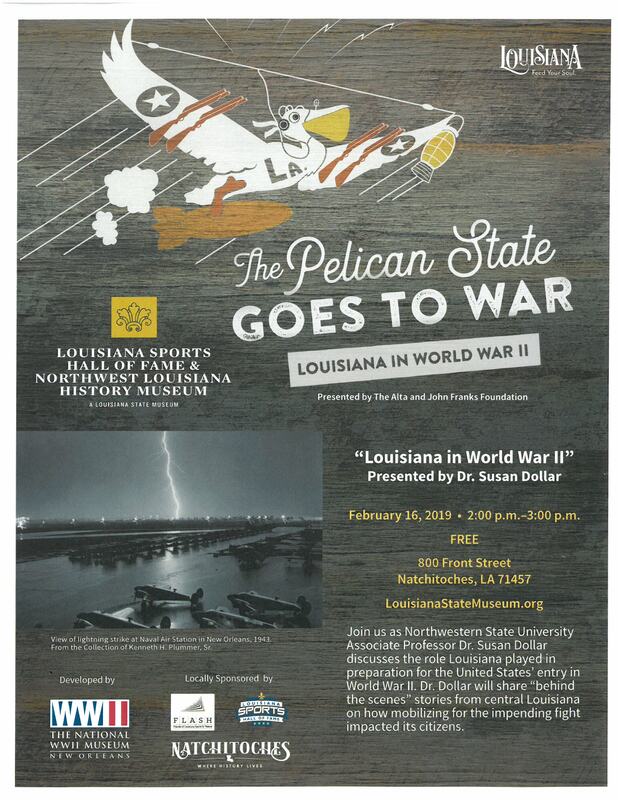 This free and public event is held in conjunction with the current exhibit on display entitled "The Pelican State Goes to War: Louisiana in World War II". Produced by The National WWII Museum, the exhibit will feature artifacts, photographs and oral histories that highlight Louisiana’s extraordinary contribution to America’s war efforts during World War II.